Europe’s biggest apple growing co-operative needed a way to increase handling and distribution capabilities. MIVOR built a highly automated, refrigerated warehouse for the storage and distribution of fresh apples. Venosta Valley, nestled within Stelvio National Park in the northern Italian Alps, presents an enchanting landscape with its clean mountain air and tiny, romantic villages. But underlying the valley’s iconic beauty is its unique microclimate, providing 300 days of sun each year with dramatic temperature differences between day and night, particularly well suited for the growing of apples. In fact, Val Venosta Valley is the most productive apple growing region in Europe, known for producing over a dozen varieties of apples such as Gala, Golden Delicious, Red Delicious, Fugi, Braeburn and Pinova. The valley’s high apple productivity has come about from the combined commitment of its farmers, who formed MIVOR, which became Europe’s biggest apple growing cooperative in 2007. Today, 400 member farmers make up MIVOR, with 2,700 acres of orchards, producing over 500 million apples annually (100,000 tons); 20 percent of this volume is organic certified. Fifty percent of the total harvest is distributed throughout Italy, with the remaining 50 percent exported to 49 countries throughout Europe, North Africa and Asia. When MIVOR was formed in 2007, its total apple production was 60,000 tons annually. Since then, the cooperative has expanded its output by nearly 70 percent. This tremendous increase in apple production has necessitated the implementation of more advanced systems for streamlining post-harvest apple sorting, storage and distribution. The harvest takes place in September. In the orchards apples are loaded into lined buckets inside of large bins. Once filled, the bins are picked up by forklifts, loaded onto trucks and transported to MIVOR’s sorting, warehousing and distribution facility in the municipality of Latsch in Val Venosta Valley. More than 300,000 bins with apples are transported to the MIVOR facility each year. MIVOR’s annual apple yield has been sorted with automation for some time. This sorting system was workable when processing half the current apple volume. But as MIVOR’s yield approached 500 million apples, an upgrade to the automated system became necessary. 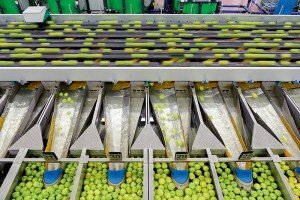 MIVOR partnered with Greefa, a supplier of produce-grading technology, to design and implement a highly automated system to sort apples swiftly, accurately and gently. The new system classifies up to 65 apples per second using 3D modeling, which assesses apple characteristics from 60 pictures for each single apple. The apples are precisely tested for internal and external quality with HD cameras and NIR (Near-Infrared) technology. They are sorted by size, colour and quality. Those that are bruised or cut, or have insect or disease problems, are immediately removed. 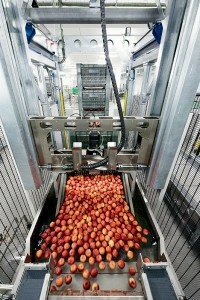 The sorting system at MIVOR is the largest fruit sorting system of its kind in Europe with a sorting capacity of 25 to 30 tons per hour depending on the apple variety. Once sorted, the apples are filled back into bins and routed via specially designed transfer cars onto a conveyor system where they are delivered into MIVOR’s new refrigerated warehouse. Like most large-scale apple producers, MIVOR cannot use the whole harvest it receives all at once. As a buffer between the sorting system and its packaging operation, the cooperative’s refrigerated warehouse comes into play. But increasing production led to capacity constraints with bulk bins and storage space in its existing refrigerated warehouse. The result was damage to the product, and accidents with forklift traffic, which led to production downtime. It became apparent that the cooperative’s warehouse was no longer adequate. The challenge was considerable, in that the warehouse needed to be built in the middle of a densely developed area of Latsch; so footprint consolidation was a critical factor. LTW Intralogistics was selected to engineer and build a solution, which came in the form of a 21,600 square-foot high-bay refrigerated warehouse, with an 88 foot-high storage capability to handle 18,600 apple bins. At MIVOR, apples are stored in a controlled atmosphere (CA) temperature range of 34°F, consisting of a modified atmosphere of two- to three-percent oxygen and one- to four-percent carbon dioxide. Apples can maintain quality under these CA conditions for four to six months. Only the highest quality apples destined for the fresh market are placed in CA storage. Advances in controlled atmosphere technology have had a dramatic effect on apple storage logistics and opened up markets previously unavailable for fresh and processed apple products. This is an advantage not fully shared by other apple producers whose shelf life extension by CA is much less. The MIVOR warehouse incorporates the latest automated storage and retrieval system (AS/RS) technology. AS/RSs are computer-controlled material handling machines for automatically depositing, storing and retrieving bins or pallets from defined storage locations. Central to this AS/RS are six stacker cranes, which permit bin inventory to be moved quickly, safely and precisely within the high-bay warehouse environment. Stacker cranes offer reliability and accuracy that exceed the capabilities of forklift trucks. Such trucks transport product in only one direction, then return with an empty load. Stacker cranes place their load into a rack position, and then retrieve a load from storage on their way back out, optimizing the crane’s movements. These stacker cranes are designed to travel at vertical speeds of 131 feet-per-minute (FPM) and achieve horizontal travel speeds of 590 FPM. Digital track positioning, infrared and laser guidance direct the movement of the cranes within the high bay. High-speed PLCs with integrated controls architecture monitor the movements of the cranes, in coordination with the warehouse management system (WMS), via Ethernet. The system coordinates with other automated equipment in the warehouse, creating one single, efficient transport system that provides optimum throughput under at capacity. Built into the high-bay structure is a secondary ambient-temperature 4,000 square-foot warehouse for the storage and transfer of empty bins. 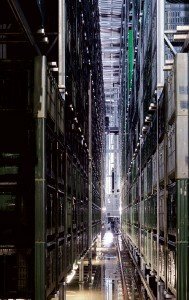 This high-bay structure is 52 feet high and is capable of storing 1,652 empty bins, accessible via a single crane AS/RS. These bins are transferred via conveyors and lifts to sorting, and to and from packaging, eliminating the need for forklift transport. Leaving the high-bay warehouse for packaging, where more than 100 employees accomplish ultra-short delivery periods, the apple bins are forklifted to an area for automated dumping of the apples into a pre-packaging water stream. Although MIVOR had been using automated dumping for some time, it required a significant upgrade to better control bin dumping, reduce product damage and improve throughput. f) is built of materials suitable for food handling in a high-humidity environment. In this process a stack of apple-filled crates is placed on an infeed conveyor using a forklift, and the number of crates in each stack is identified. The top crate of the stack is automatically grabbed by a gripper, then identified and emptied or partly emptied into the water stream without damaging the goods. After the emptying process, the empty crates are automatically stacked on an adjacent conveyor, taken over by a transfer car, and transported to a fork lift removal location for empty crates, or the crates are transferred automatically back into the empty-crate warehouse. The dumper is equipped with a camera, which identifies every crate before emptying, while informing the facility’s production planning system to ensure the tracking of apples from each crate. MIVOR’s fruit dumper can process up to 40 bins per hour. LTW installed 16 fully automated dumpers in the pre-zone of the packaging area. MIVOR’s automated warehouse provides significant benefits for the co-operative’s operations. It delivers rapid throughput at near 100 percent accuracy levels. It permits efficient bin handling and product rotation on a first-in/first-out basis, which better manages product freshness and is essential to supporting the needs of MIVOR’s marketplace. It reduces warehouse labour, improves accuracy in inventory and order fulfillment, lessens product and facility damage from forklift usage, and streamlines energy usage. Because of the warehouse’s highly automated computer-controlled AS/RS and WMS, the facility is capable of monitoring batch numbers, processing dates and weight as the apples and bins are moved through and stored in the facility. This level of analytics allows MIVOR to maintain precise control of its apple products through every stage of their handling—from receiving, to sorting, storage, and through packaging and shipping. “We have full process and product security, with traceability of every apple back to the orchard,” Pinzger says. “Throughput delays are at all-time low. And we are seeing 33 percent energy savings. Read the article in MMDonline.com here.